I remember receiving my college financial-aid package in 1974, and among the grant and work-study information was a letter about my eligibility for a National Defense Student Loan. I don’t remember what the letter said, but I do remember stopping cold. What did my acceptance to a residential liberal-arts college have to do with national defense? The National Defense Education Act was passed in 1958 to provide funds for higher-education institutions, which in turn distributed the funds to students to help meet the challenge to the United States mounted by the Soviet Union during the cold war. As an 18-year-old son of a turret-lathe machinist and a file clerk, I didn’t know anything about the Defense Act. What did resonate was that my acceptance to college had somehow made me important to national defense and that getting a college education was in some way linked to the progress of the nation and the advance of the civilization. And so that letter from the government and loan form asking for our signatures was at once humbling, frightening, and riveting. A lot has changed since 1974. At some point, “NDSL” ceased to signify National Defense Student Loan on its materials and became the National Direct Student Loan program; today we know these as Perkins Loans. The evolving nomenclature is telling. The war in Vietnam, as it persisted into the 1970s, damaged the reputation of the U.S. military and, in particular, national-defense policies. Nowhere was that damage more apparent than on college campuses, where the antiwar movement would insist that college and military be understood as separate, if not antagonistic, endeavors. Writing a loan-repayment check to the “National Direct Student Loan” program would be more palatable than writing it to the “National Defense Student Loan” program. But that linguistic accommodation signaled a damaging distinction in national spending priorities. “Perkins,” of course, removes the government from the brand entirely and creates the impression of a private transaction. Therein lies the root of our contemporary problem. Two of the largest institutional expenditures that the federal government undertakes—setting aside health care for the moment—are national defense and higher education. Parallels between defense and education spending are intricate. On the surface, and readily apparent, is the need to defend the nation against hostile forces, and the need for highly educated, and technically and strategically trained people to lead the effort. How much defense is enough? In national defense, we may measure the worth of our spending by the capacity of our national security forces to forestall attacks on American citizens—as long as we feel safe, we might contemplate reductions; as soon as we feel threatened, as we saw after 9/11, we’ll conclude that we need to spend more. And with higher education? We tend to measure the worth of education by the kinds of jobs and careers that college makes possible. But that equation is problematic. It would be like measuring the worth of defense spending by the jobs created in the defense industry. Yes, defense creates jobs, but jobs are not the reason we have national defense. Yet if we measure the worth of education according to the rate by which we find creative solutions to national social problems, we might conclude that we’ve undersupported our future. My National Defense Student Loan was not awarded to me so that I could get a better job, nor was it predicated on my entering the defense industry. “Defense” loans were applied as readily to liberal-arts colleges as they were to engineering school­s—mine was at Haverford College, which, as a Quaker college, was about as distant from the military as one might land. What was expected of me in return for the loan was that I would become an educated member of society, based on the assumption that higher education created the kinds of minds needed to protect our nation and our democracy from succumbing to forces determined to destroy both. Higher education is understood by this logic to be primarily a social, and not simply a personal, resource. The premise, which may need repeating now more than ever in the past 50 years, is that enlightened societies—democracies, if you will—know that their future security lies not in reverence for past achievement nor in the perpetuation of exhausted ideas, and certainly not in individual devotion to self-advancement. History shows us that democracies rely on individual inspiration: on the free expression of creative ideas, often critical and sometimes audacious, that emerge from minds that are intimately familiar with what human beings have thought and said and attempted in the past. We call this an education in the liberal arts, by which we mean all of the ways in which we have, for thousands of years, practiced the art of being human. Perhaps we’ll awaken from a collective trance that has been stealing upon us in recent decades—the idea, manifest in various forms and modes of expression, that education should be cheaper, easier, quicker, and that its value ought to be measured in individual career achievement. Such contemporary myopia is purchased by the very human failures that higher education is designed to counter. We have, in this same era, failed to inspire: We have tired ideologues seeking public office, we have a Senate in Washington that cannot govern because its members will not listen, engage, and compromise with ideas different from their own. I’d recommend courses in philosophy and history to U.S. senators who think that the conviction that one is right and that one’s antagonists are wrong is the endpoint of contemplated action, or that such a conviction is anything short of lunacy. History shows us time and again that being right is never enough to solve problems. When President Lincoln spoke at Gettysburg, he did not rail against the Confederacy, nor did he gloat over what might foolishly have been cast as a Union victory. He said, “It is for us the living, rather, to be dedicated here to the unfinished work which they who fought here have thus far so nobly advanced.” Despite the Civil War, the future of the nation was cast in collective dedication, not in victories and defeats. As the president of a liberal-arts college with a public mission, I remind our students that the nation—and the very planet we inhabit—needs their creative responses to the long history of human thought and action that has preceded us. I imagine they will go on to find jobs, but that’s not why I’ve dedicated my life to their education, and it’s not why I signed that National Defense Student Loan agreement almost 40 years ago. The nation and the world need individuals who have cultivated their capacity to think, to discern, and to respond with creativity and passion to the dilemmas that define our predicament. A liberal-arts education reveals that most new ideas are forgotten old ideas. I’m dusting off the idea that the purpose of higher education is national defense, such as the defense against political intransigence and against the willful ignorance of the great American tradition of compromise. Going to college is not simply about making oneself more financially comfortable. Higher education is much more important to our collective future, and those who wish to pursue it deserve the kind of national investment we place in anyone who dedicates his or her life to the preservation and defense of our nation. 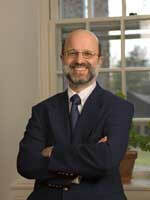 Joseph R. Urgo is president of St. Mary’s College of Maryland. This essay was originally published in The Chronicle of Higher Education, April 29, 2012.